I am new here so bare with me have had a wrangler last 7 Year’s and still do but I’m in the process of buying a 91 mj. What I have seen on all the parts interchangeability with xjs where pre 90s. Are all mjs body wise the same I know some electrical changes happened. Major body parts ... yes. There were minor changes. For example, the hood latch mechanism changed in 1987. The grille and headlight bezels changed from 1990 to 1991. What exact parts are you looking at? For the most part they are pretty much the same with subtle differences. The parts that are the same as an XJ will always be the same as a same-year XJ, at least from the factory. 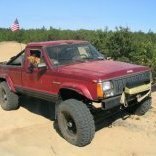 Any changes that happened to the XJ also happened to the MJ. As for changes specific to MJ parts, well, trim options changed a bit between '86 and '87. The rear bumper brackets changed in '87 when they came out with the short bed. (Brackets are the same between bed lengths, but now have clearance for the short bed's rear spring hanger). Mostly it's inconsequential stuff. The MJ was fairly small scale production, and it didn't really benefit them much to switch out parts unless they needed to either for continuity with the XJ, or some other necessity. Thank you all! I am going tomorrow to look at the truck so nothing off the top of my head yet but I will be asking pretty soon I’m sure! yeah, once you know specifics it'll narrow down what you need. It might be easier to ask what parts are MJ specific that you should look out for, as sourcing parts for the specifics are going to be much harder if they are missing. Things like the tail lights, the cab vents, the rear fender flares, fuel pump, tail gate. If all of them are there and in good shape, finding the rest of it should be easy.